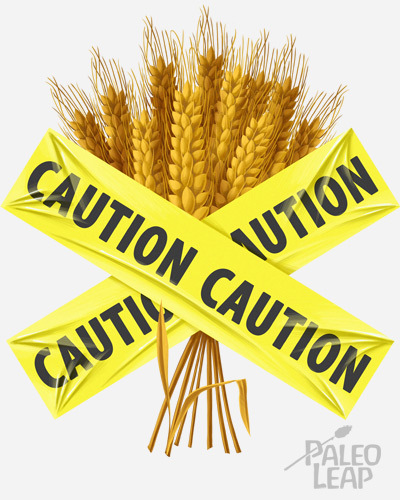 Non-Celiac Gluten Sensitivity: The Gluten or the Wheat? How many times have you heard something like “you don’t need to avoid gluten unless you have Celiac Disease”? And how many times have you rolled your eyes a little because you know what eating wheat does to your body even if the person talking to you thinks you’re making it up? One of the most contested Paleo claims is that people should avoid cereal grains even if they don’t have Celiac Disease, and one of the biggest villains in the story is gluten, a protein found in wheat, barley, rye, and some other grains. You could support the argument for avoiding grains by pointing to long-term problems like low-grade gut inflammation causing cumulative issues down the line even without any direct and dramatic symptoms. But there’s also a case for more obvious and immediate problems caused directly by eating wheat, even in people without Celiac Disease. An increasing number of recent studies seem to support this by identifying patients with symptoms that disappear on a gluten-free diet even though they don’t have Celiac Disease or a wheat allergy. Those symptoms are known as “non-Celiac gluten sensitivity,” or NCGS for short. NCGS is basically a “diagnosis of exclusion:” if you have a problem that you can fix with a gluten-free diet, but you don’t have Celiac Disease or a wheat allergy, then you have NCGS. But one big problem with this is that nobody can convincingly explain how the gluten is causing the symptoms. Of course, it’s very possible that we just haven’t figured out the relationship yet. But some researchers also argue that NCGS is actually caused by something else in wheat, and the gluten-free diet helps because it eliminates wheat as a whole, not because it eliminates gluten specifically. This is obviously important for the case against wheat and cereal grains (including non-gluten grains). NCGS could be evidence of harm occurring even without a Celiac or wheat allergy diagnosis. But does it actually exist, and even if it does, is it really caused by gluten? Here’s a quick look at some of the studies. Skin problems. This study described 17 patients with NCGS who had “itchy dermatological manifestations…similar to eczema, psoriasis or dermatitis herpetiformis,” and whose skin symptoms got better on a gluten-free diet. Gastrointestinal problems. This study found that some (although not all) patients with Irritable Bowel Syndrome improve after eliminating gluten, which points to problems like constipation, diarrhea, and bloating as potential symptoms of NCGS (although they can also be symptoms of all kinds of other things). Fatigue, “brain fog,” joint pain, and other systematic symptoms. Some research has tentatively linked NCGS to problems like fibromyalgia and rheumatic disease, but this is still pretty speculative. This study also showed two things: first, many patients with NCGS also have an allergy to dairy proteins, and second, they’re also at a higher risk of bone mineral density problems. Both of these are also associated with Celiac Disease. For all of these problems, the symptoms go away when the patient eliminates wheat and other gluten grains – that’s how the diagnosis of NCGS was made in the first place. So this looks like pretty good evidence that gluten can cause significant and immediately obvious problems even in people without Celiac Disease. But nobody knows how gluten is causing the symptoms. It doesn’t have obvious physical signs like Celiac Disease. Some studies have found that gluten causes symptoms by modifying gut barrier function, while other studies disagree. This review suggested a “multifactorial process” including the immune system, direct effects of gluten on cell behavior and homeostasis, and potentially the inflammatory activity of other proteins in wheat (more on this below). The study clarified that there are some reported measurable changes in people with NCGS; for example, about half of patients have a certain type of antibody to gliadin (which is one part of the gluten protein). 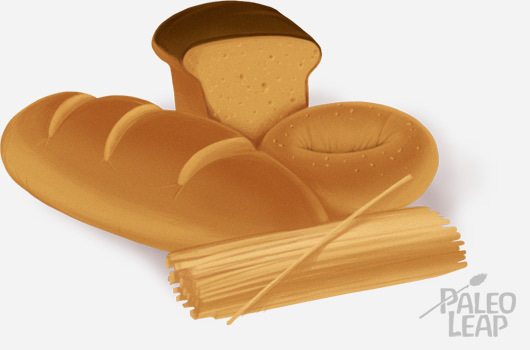 But it’s still not clear what the link is between the gluten and the symptoms, other than the fact that it’s there. Not knowing how gluten specifically causes the symptoms has led some researchers to propose that gluten sensitivity isn’t actually a reaction to gluten. Instead, it may be a problem with something else in wheat. Instead of focusing on gluten, several studies have looked at different parts of wheat that can cause inflammation and an immune response in the gut. This study and this one, for example, looked at proteins in wheat called amylase trypsin inhibitors (ATIs). ATIs can stimulate an inflammatory immune response in the gut even without Celiac Disease. Other research has looked at the same problem with wheat germ agglutinin, another component of wheat that may cause gut inflammation even in very small doses and even in people without Celiac Disease. This study is in a journal called Medical Hypotheses, which tells you right away that it’s more of an educated guess than something with very solid proof, but the author suggests that the problem isn’t wheat per se, but extreme modern wheat processing and recent changes in wheat varieties. In all of these cases, the symptoms are real and the gluten-free diet really helps, but that’s because it eliminates everything else in wheat along with the gluten. Another potential explanation is that NCGS isn’t actually caused by an immune/inflammatory response to proteins in wheat, but that it’s actually about the carbs. This study blamed FODMAPs carbohydrates found in wheat as well as several other foods. The researchers looked patients with both NCGS and Irritable Bowel Syndrome (IBS). All patients improved on a low-FODMAP diet. When the researchers tested their patients with purified gluten (not wheat, but just the gluten), it only made a difference in 8% of cases. The researchers concluded that since they respond to the same treatment and gluten didn’t make much of a difference, NCGS might really be a type of IBS. On the other hand, this might ignore patients who have non-gut-related symptoms of NCGS, and it’s complicated because the patients had two problems at once. NCGS and IBS have similar symptoms. But not all IBS patients benefit from removing gluten without any other treatment, and some IBS patients see symptom improvements even without gluten elimination (for example, from taking probiotics). As this study concludes, it’s just not clear yet whether NCGS is an immune/inflammation-related disease similar to Celiac, or whether it’s part of IBS with the symptoms being caused by other parts of wheat. In the past few years, quite a bit of research has identified a group of people with symptoms that benefit from gluten-free diets. Some researchers argue that this is a non-Celiac, non-wheat-allergy response to gluten. Others agree that the symptoms are real, but blame some other component of wheat for the problem. The latter is perfectly compatible with Paleo as well: nobody ever said that gluten was the only bad thing in wheat and other cereal grains. The FODMAP hypothesis is interesting because it suggests a possible avenue to explore if gluten elimination alone isn’t doing the trick, but there’s at least some evidence that an immune/inflammatory reaction is going on (possibly on top of any FODMAP issues), and that NCGS isn’t just a type of IBS. Ultimately, several studies do suggest that wheat really can cause immediate and obvious symptoms (both digestive and otherwise) even in people without Celiac Disease. The debate is still ongoing as to whether this is actually caused by the gluten in the wheat or whether it’s caused by something else, but it doesn’t matter terribly much from the perspective of someone who just wants to heal her gut, because in both cases the solution is to ditch the wheat (and other gluten grains).